The researchers, including professors at Stanford and in Europe, are drawing from disciplines as disparate as history and chemistry to analyze their findings, which they've already begun synthesizing into a database of unprecedented depth and scope. Their study spans the years from the 12th century to the 16th century, when the Teutonic Order, a Germanic brotherhood of Christian knights, waged war against the last indigenous pagan societies in Europe in a region that includes modern-day Poland, Lithuania, Latvia, Estonia, Belarus and parts of Sweden and Russia. Fighting under the guise of religion, the warriors exploited the Baltic's pristine forests and rich fauna to foist an urban, Christian way of life on tribes that viewed many elements of nature as sacred. Within a few centuries, the Teutonic warriors led a major ecological and cultural transformation that swept the pagan Baltic tribes into the fold of European Christendom. While historians have developed a solid chronology of the events during this time period, the archaeological record remains murky. By taking a multidisciplinary approach, the researchers hope to "achieve a much more nuanced understanding" of how the region flourished into a hub for the movement of goods and technology, said Krish Seetah, an assistant professor in the Department of Anthropology and the Archaeology Center at Stanford. A major part of the project, which is funded by a four-year grant from the European Union's Seventh Framework Programme, seeks to illuminate how the crusaders exploited the region's wildlife, an effort led by Seetah, who specializes in zooarchaeology. The Teutonic Order owed the success of its conquest largely to horses, whose strength and stature allowed them to bear armor and weaponry, unlike the pagans' much smaller horses, Seetah explained. Historians can draw comparisons to other wars, like the Southern Crusades in the Middle East, where the Arabian horse, stronger and swifter than the European breed, ultimately led the Islamic crusaders to victory. "Underlying war was the use of animals for war," Seetah said from Mauritius, an island nation off the southeastern African coast, where he's currently doing fieldwork on slavery and indenture. The researchers also want to compare culinary preparation across cultures. To do so, they're relying on a variety of methods, including analysis of food processing tools and butchery techniques, as indicated by cut marks on animal bones. "We see a difference between food cultures in how animals are processed," Seetah said. "Pagan groups did it differently from the Germanic Teutonic Order." For example, the team's preliminary research unearthed evidence that the Baltic pagans ate dogs, which they abruptly stopped doing after the Teutonic invasion, reflecting the newcomers' distaste for dogs as food. Studying the archaeological record of how cultures prepared food can inform us of their interactions and evolution over time. Archaeologists could apply this method of understanding how cultures bring their unique food traditions not only to other instances of colonialism but to any migration, from the slave trade in Mauritius to the immigration that opened the array of ethnic eateries along University Avenue just off the Stanford campus. The project also looks at the Teutonic crusaders' other uses of animals – for hunting, as well as trading fur and livestock, for example. In a novel collaboration with the SLAC National Accelerator Laboratory, Seetah and colleagues are using a technique called X-ray fluorescence spectroscopy to analyze the chemical and molecular composition of animal bones in order to identify not only their species and use but also their movements along trading and herding routes. Although archaeologists have used the technique to analyze paintings, this marks the first time they've used it to study bones in this context. They also rely on a method called geometric morphometrics, which looks at the shape of animal body parts, mainly teeth, to track their travel patterns. Increased reliance on animals inevitably led to the extinction of some species, including the aurochs, an ancestor to modern-day cattle. The relatively rapid disappearance of species marks a dramatic shift in how the indigenous Baltic culture perceived the natural world. A belief in the interconnectedness of the land's flora and fauna gave way to a more utilitarian, Christian view of nature. Changes in dwelling structures also provide a framework for understanding the Baltic Crusades. 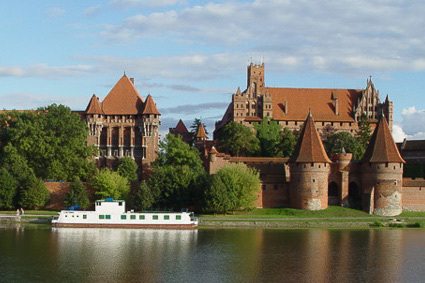 The research team compared Teutonic castles – massive forts whose construction required clearing of vast expanses of forest – to the less intrusive pagan settlements. Medieval castles that today appear as crumbling, moss-grown relics bore in their time striking similarities to present-day urban centers, forming the backbone of the new Christian states. Characterizing the ecological impacts of these castles can reveal how urbanization affects surrounding habitats. The team is building a database integrating the historical, archaeological and ecological evidence collected since the project began in 2004, led by Aleks Pluskowski of Reading University in England. By the time the researchers complete the project in 2014, they hope to link the data chronologically, so that when they click on a time period, they can also call up all the data associated with it. Archaeologists have applied the techniques used in Pluskowski's study to other contexts, but none through such a multidisciplinary approach, Seetah said. "This is an archaeological project at the forefront, metaphorically and methodologically," he said. "It's integrating historical narratives, ecological data, archaeological data and, of course, anthropological perspectives and religion. It's beautifully positioned to study human activity in the environment in a way that's informative simply because it combines a range of interactive models."